Welcome to the pride of the Andaman sea! She was newly refurbished in the year of 2012, is a 28.5-meters long and 7-meters wide, twin-engine steel hull motor boat, with the highest safety standards on board. 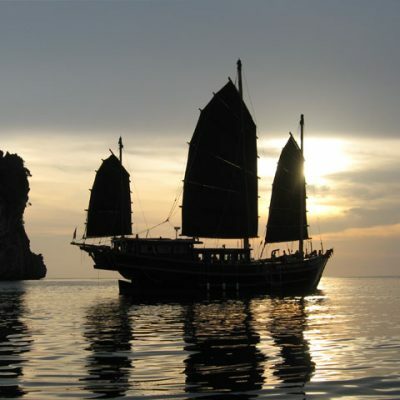 She will be operating along Thailand’s Western Coast and offering incredible diving safaris to locations that include Similan, Surin National Marine parks and Richelieu Rock along with exclusive safaris to the little explored Mergui archipelago in Burma. 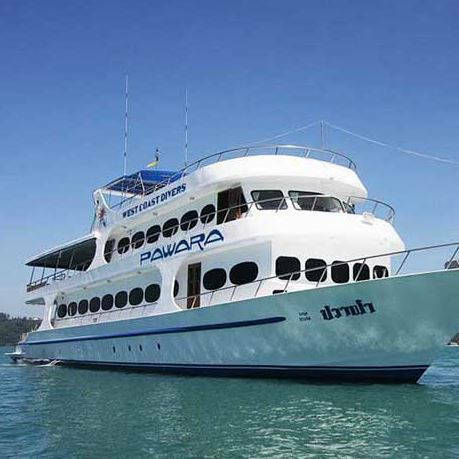 From May until August, she is ready for charter rent in the area of Andaman southern sea, offering the chance to enjoy the incredible diving on offer in areas such as Koh Haa and Phi Phi along with the world class diving at Hin Daeng and Hin Muang and the coral gardens of Tarutao National Marine Park. All cabins onboard have air conditioning, en-suite bathroom with toilet and warm water shower. We have a variety of cabin configurations to suit our guests varied needs, from standard quad, triple and twin share cabins on the lower deck, Deluxe Double bed and Deluxe Twin bed cabins on the main deck. Not forgetting the pride of the vessel, our Master cabin, which boasts the best panoramic view any liveaboard master cabin can offer. 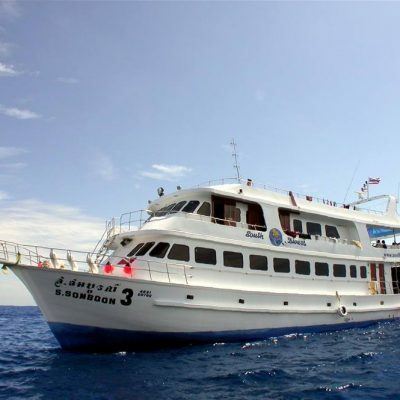 This “GOLD” class vessel also offers our guests one of the largest and most comfortable dive platforms in South East Asia; designed for divers. The Saloon on board is very comfortable, with large panoramic windows, a TV/DVD/music entertainment center, cushy couches, and a full selection of marine life books & diving magazines. The main deck outside of the Saloon is a shaded seating area (dining area) where you can enjoy watching some scenic views across the islands. In front of the Captain’s cabin, there is a large bench perfect to sit and watch things pass by. Sunbathers can enjoy the top desk, where there is a large 60 square meter half-shaded sun deck equipped with sun beds, lounge chairs and soft sofas. The sun deck is very popular among our guests as you can read your favorite novel or take a nap during the surface interval on our nice clean and comfortable leathered sofas. This is also the best place to spot friendly dolphins cruising along with the boat. 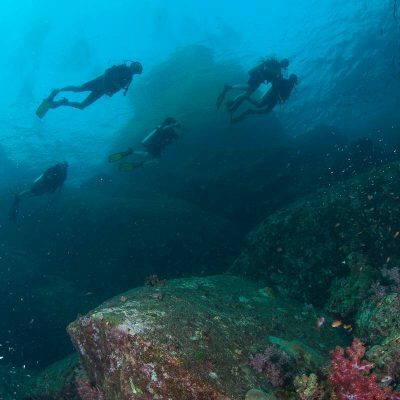 In the evening, you can relax and chat about the day’s diving while enjoying an amazing night sky. Taking in some of the best star-gazing in the world, many guests choose to sleep on the top deck and wake up to a beautiful sunrise. 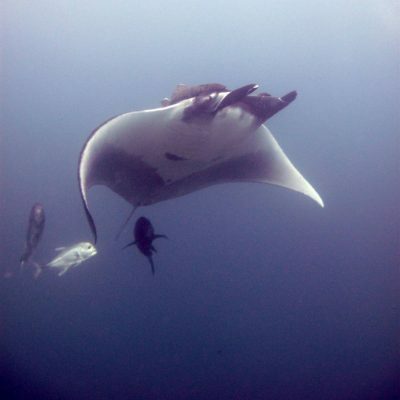 One of the pleasures of diving with us is that you don’t have to worry about long surface swims after a dive! We will ensure you are picked up safely and quickly by one of our two dinghies or by our big boat. Once safely back on the boat, the crew will assist you with your dive equipment and offer you a cool drink. Enjoy our delicious world class food after the dives and continue with the relaxing schedule of the trips. On the day of departure we will pick you up at your location of choice anywhere in Phuket or Khao Lak (including the airport) and transfer you to the Dive Center where you can make your deposit, balance payment by cash or credit card (3% service charge for credit card sales via Visa or MasterCard). After the check in is completed you are welcome to use the social networking areas for Internet services or you can relax by the pool prior to the boat departure if time permits. When you have seen your cabins and had dinner, there will be time to set up equipment and make a thorough check before leaving. The boat departs with traditional Thai fireworks and then you will receive a short but important boat briefing. 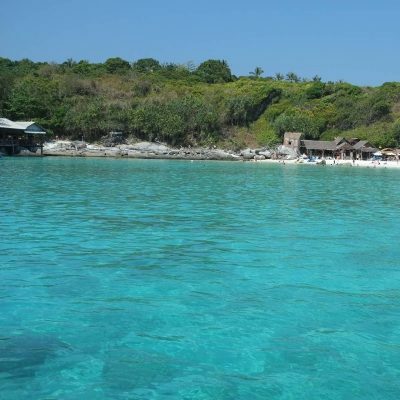 You will wake up in the Similan Islands with a nice cup of coffee or tea and a light first breakfast waiting for you. The trip leader gives a dive safety briefing and dive site briefing and the diving in paradise begins! 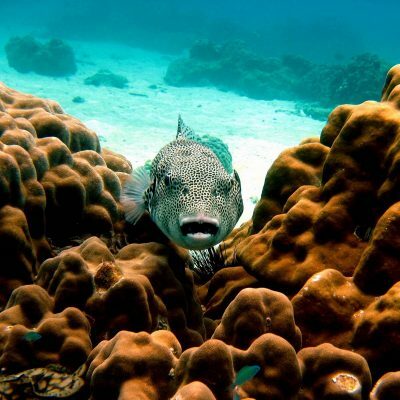 The remaining schedule is simple: eat-sleep-dive-repeat… The boat has a slightly flexible schedule for the dive sites so we can choose the best for you. After the trip ends, you will be picked up at the pier at 2:30 PM to return to the Dive Center. Arriving at 3:00 PM you have time to sort out your luggage and comment on Trip Advisor or Facebook about your amazing trip if you want. At 4:00 PM you will be transferred to your hotel, resort or airport in Phuket or Khao Lak. *Marine Park Fee must be paid CASH on board in Thai Baht and Myanmar Entry Fee in USD!!! For safety reasons and comfort of all passengers on board, children under the age of 10 years will be allowed only by special prior arrangements. Children under 16 years of age must be supervised by a parent or guardian, unless partaking in a course. gold6cuisine, from traditional Thai food to mouthwatering Western courses. In addition, fresh seasonal fruits and snacks are served throughout the day. On the first night, we serve a sumptuous welcome dinner before leaving for the Similan Islands. In the mornings before diving we offer croissants, cake, toast, fruit, coffee, and tea. After the first dive, a full American-style Breakfast is served, with eggs, bacon, beans, potatoes, sausages and more. Lunch and Dinner are either delicious Thai dishes or Western dishes. All meals are served buffet-style in the sitting area of the main deck. We can cater to all dietary requirements, but please send us your requirements in advance! Coffee, tea, hot chocolate, water, sweets, fruits, yogurt, biscuits, juices, and soft drinks are served free of charge. DIN adapters are available; please let us know in advance! We offer many optional services and equipments for your trip. We will add them to your final bill upon your arrival to Phuket. Do not hesitate to contact us for more information or for any special requests.